The home search that follows shows current Active and Pending listings of homes for sale in the Bauerle Ranch subdivision. If you have a question, or want to schedule a NO PRESSURE TOUR of homes in Bauerle Ranch, call Jim at 512.913.1557. Neighborhood Location: The Bauerle Ranch subdivision is located in South Austin. The neighbrhood has two entrances: Lindshire Lane from W. Slaughter Lane, and Lynnbrook Dr. from Manchaca Rd. and Old Manchaca Rd. The subdivision is roughly halfway between I-35 and Mopac (Loop 1) via W. Slaughter Lane. 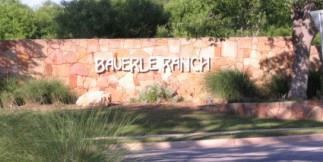 Scroll down to view more info on Bauerle Ranch. The data in the table below are intended to provide a snapshot of Bauerle Ranch real estate market activity over the past 8 years. Real estate market stats from the Austin Board of Realtors, 1/1/11 through 12/31/18. The homes in Bauerle Ranch, a mixture of single- and two-story homes, were built by D.R. Horton Homes. The neighborhood was started in 2002, and build-out was completed in 2008. The home features include raised ceilings, garden tub with separate shower, 3 sides masonry (stone or brick), Hardiplank siding, kitchen backsplash and raised-panel cabinets, and privacy fences. Homes in Bauerle Ranch range in size from 1,756 sq. ft. to 3,384 sq. ft.
Bauerle Ranch has a beautiful amenity center with a large owners-only swimming pool, playscape for children and basketball court. In addition to its nice homes, the neighborhood is built alongside of 300 acres of green space (the Slaughter Creek Greenbelt). The neighborhood has lovely landscaping, a park area, sidewalks and street lamps. Bauerle Ranch is close to schools and plenty of shopping, including the new Southpark Meadows shopping and residential development at W. Slaughter Lane and I-35, and the shopping centers at Brodie and W. Slaughter and Manchaca and W. Slaughter. Homeowners in Bauerle Ranch and the Estates of Bauerle Ranch must belong to the Bauerle Ranch Neighborhood Association (HOA). The HOA manages oversees common area upkeep, deed restrictions, the amenity center and more. Students living in Bauerle Ranch learn the 3 R's at schools of the Austin Independent School District (AISD). If you are considering a home purchase in Bauerle Ranch, be sure to check with AISD for current assigned schools and other school information.